The unadjusted trial balance is a list of ledger accounts and their balances that is prepared after the preparation of general ledger but before the preparation of adjusting entries. It is the third step of accounting cycle and is usually prepared at the end of accounting period. After preparing adjusting entries, an adjusted trial balance is prepared that can be directly used for the preparation of financial statements. 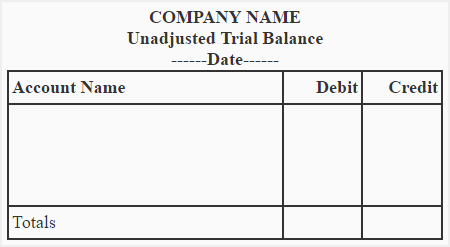 The total of the debit column of the unadjusted trial balance must be equal to the total of the credit column. If they aren’t in agreement, it means that the trial balance has been prepared incorrectly or the journal entries have not been transferred to the ledger accounts accurately. 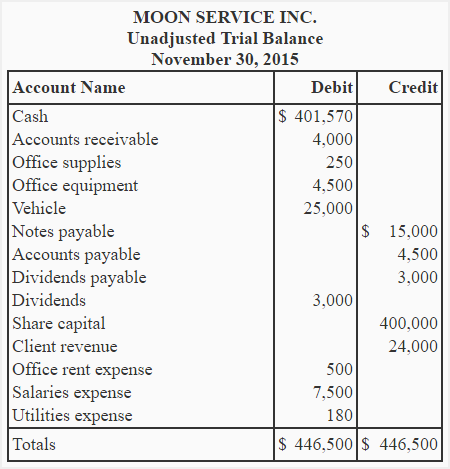 We can prepare unadjusted trial balance from the ledger accounts of the Moon Service Inc. prepared on the general ledger page. The main purposes of preparing an unadjusted trial balance is to check the mathematical equality of debits and credits. A debit amount has been incorrectly posted as credit or a credit amount has been incorrectly posted as debit. The balances of the ledger accounts have been incorrectly determined. The balances of ledger accounts have been incorrectly copied to the trial balance. A debit balance has been incorrectly listed in the credit column or a credit balance has been incorrectly listed in the debit column of the trial balance. The debit or credit columns of the trial balance has been incorrectly totaled. The transaction is not correctly analyzed and recorded. For example, the receipt of cash is erroneously debited to another account instead of cash. A transaction is completely omitted from the journal or ledger. The debit and credit amounts of a journal entry are equally overstated. The debit and credit amounts of a journal entry are equally understated. We may conclude that if the trial balance is balanced, the errors may or may not exist; and if the trial balance is not balanced, the errors certainly exist. Hi thank you for your basic concept to accounting but you may post the questions and answers which will help the biginner ones.